Well before the sun crept over the horizon, all the JR Iditarod Mushers were back on the river heading to the finish line in Willow. After the snow of yesterday, the sky cleared over night and by this morning the temperature was at -15 degrees. Winds were calm and so for mushers and sled dogs it was just about perfect weather for the 75 mile run to Willow. Efficiency describes the mushers working with their dogs at the checkpoint. For being young, these kids are admirably good at what they do. They have the skills and routine of camping down pat. They are efficient in cooking and tending to their canine athletes. It’s fun to watch them move up and down the gangline with a purpose, not wasting time and energy but always accomplishing something. The mushers could be the definition of efficiency of human movement. With teams arriving in such close proximity, departure was the same. Grace Nolan headed to the river at 5:28 followed in two-minutes by Colby Spears. Bailey Schaeffer followed one minute later, with Chandler Wappett out just two minutes later. There was a four-minute break before Emma Shawcroft left followed by Anna Stephan. Talia martens departed one minute before 6:00 am. Charmayne Morrison led the final four onto the trail at 6:10. Christina Gibson followed 6 minutes later then Mikah Whitehead went out at 6:24 am. Lara Renner departed at 6:44 followed by Christian Gibson at 6:46. The youngsters departed with spirited dogs. They were up off the straw and ready to run, barking and lunging into their harnesses. The canine chorus was pretty impressive. Surprising how some of the biggest dogs bark in soprano and some of the more petite dogs are strong bases. 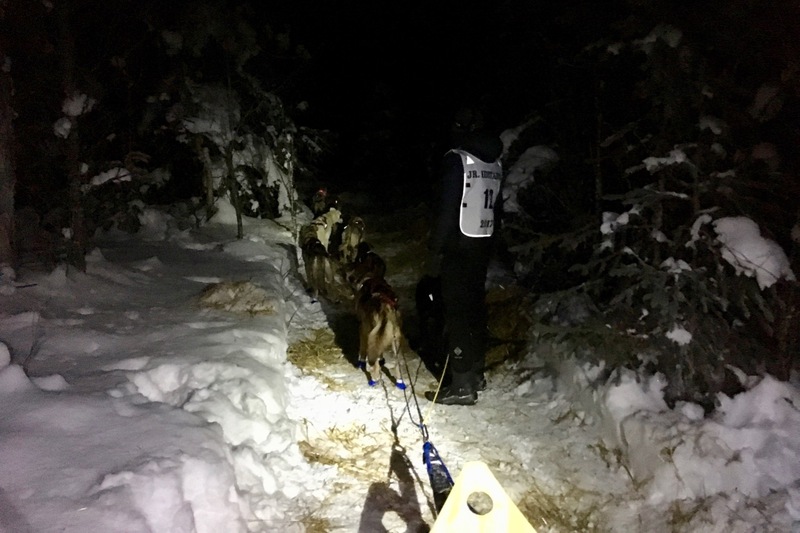 As departure neared for each team and the mushers booted the dogs then connect the neck and tug lines, the volume of the chorus increased from forte to triple forte! But when the snow hook was pulled, the dogs were all business – run and pull the sled. With the snow of yesterday, the volunteers staffing the Yentna Checkpoint traveled out by snowmachine. With the clear weather today, planes will be in this morning to collect those who road double on a machine and also the dropped dogs. It’s a beautiful day for mushing. It’ll be a very exciting finish, maybe even a photo finish. Check the JR Iditarod webpage for trail updates. GPS tracker is also available.